This sounds pretty good but it seems to have little to no chatter about it online. I reviewed it back in 1970. I can't find the review but I'm pretty sure I dismissed it harshly. It was part of a mini-genre of campus unrest movies that included The Strawberry Statement and Getting Straight, also 1970. I re-watched both of those last year and found them interesting mostly as historical documents, although if you weren't a college student in 1970 (the year of Kent State) it might not have the same resonance. I remember them as well but never saw any of them at the time of their release as I was only 14 or 15 and they were rated R. By the time I caught up with them in college they seemed hopelessly dated. As Mr. Sheldrake suggests they are of interest mainly as social/historical documents. 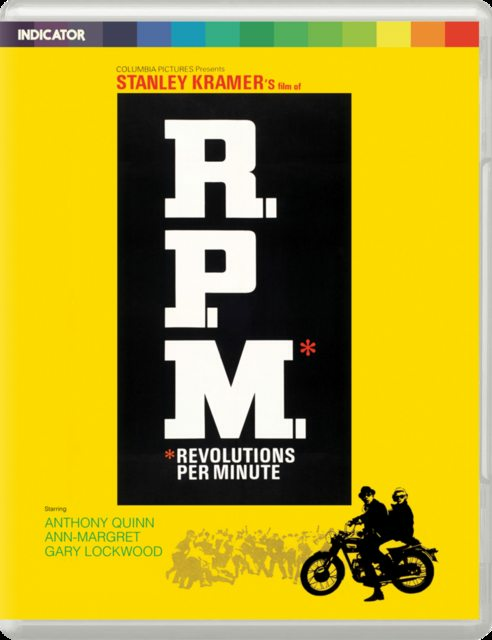 I do recall that one critic described R.P.M. as "Stanley Kramer letting his hair down" and thinking this hilarious as Kramer seemed to always sport a vintage 50's/60's crew cut in every photograph of the period. It could be Kramer's Zabriske Point! Maybe he should have gone by your last name instead. ...I believe Quinn's college prez rides a Harley and is having an extramarital affair with student Ann Margaret. The screenplay is by Erich Segal. the idea of a Stanley Kramer movie about the New Left —with Ann-Margret!—sounds totally grotesque and thus part of me really wants to see this. funny enough, my undergraduate advisor was long working on a book about guys who seem essentially like the way the Quinn character in this film is described: New Deal era left-wing intellectuals in positions of authority at American universities in the 1960s and 1970s who have to figure out how to deal with—and crucially how to negotiate with—campus antiwar and other radical protestors to whom they're broadly sympathetic but whose disruption of campus life their new institutional roles can't abide. That description sounds infinitely better than what I imagine this could be. Too bad Phillip Roth is too busy being dead to write it. Because of this thread I did dig this out of the garbage and it's about what you'd expect. It's a lot better than the average Kramer film, but still bad. It's biggest problem is definitely Kramer himself who directs this in a totally tone deaf way though there's some real issues with the script as well. The byline is actually pretty brilliant: what if Herbert Marcuse became the president of a university. Whaleallright's description above isn't really accurate as Quinn is the instigator of the mess he's assigned to fix up and in general represents a more left type figure. Throw in some half kidding quotations of the films gaining traction at the time and this really has the making of something good. In fact up through the opening credits I was semi-hopeful. Unfortunately the film pretty quickly reveals that it doesn't know what it wants. Does Kramer want to be one of the cool kids or is he trying to tear down the Marcuse types, he's definitely against the students, is something the film never works out.